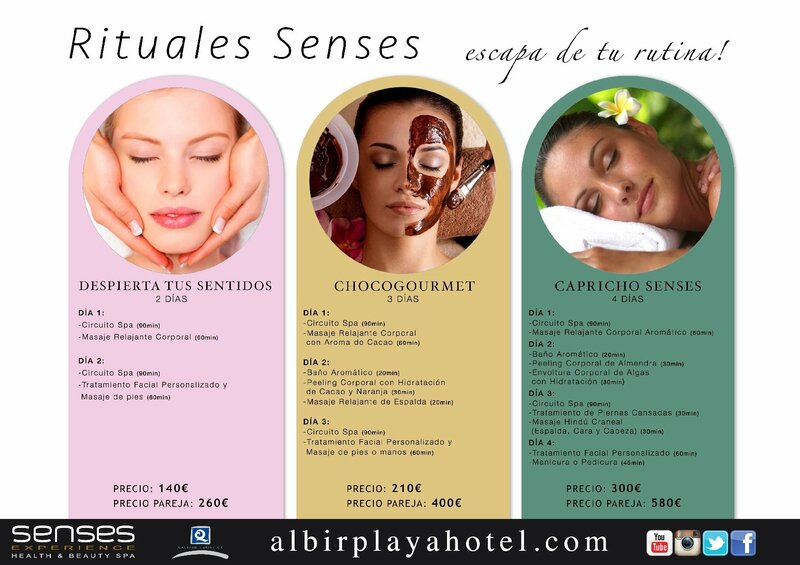 Allow yourself to be pampered in a wellness centre unique of its kind in all Costa Blanca: the Senses Experience Health & Beauty Spa of Albir Playa Hotel & Spa. Phone number: 96 686 89 15 . Monday to Thursday 10:00 am to 20:00 Hrs. Friday and Saturday 10: 00hrs to 21:00 Hrs. Massages "It is essential to contact the Spa to confirm your appointment at 966 86 89 15"
Enjoy the relaxing effect of Senses Spa in Albir Playa Hotel & Spa and combine it to our magnificent buffet. The perfect combination. 1 Day Program "It is essential to contact the Spa to confirm your appointment at 966 86 89 15"
Body Treatments "It is essential to contact the Spa to confirm your appointment at 966 86 89 15"
In our Spa Senses Experience you can enjoy any type of treatment you need. "It is essential to contact the Spa to confirm your appointment at 966 86 89 15"
Facial Beauty "It is essential to contact the Spa to confirm your appointment at 966 86 89 15"
Hair Removal "It is essential to contact the Spa to confirm your appointment at 966 86 89 15"